Do you have a model railroad layout or scene that you would like to share and showcase on this site? If you’re like me, you may have been building layouts for years, with no one ever knowing about it except for your family and a few friends. Building a model train layout is a major accomplishment. It should be recognized. If you don't show it to anyone, it’s like writing a book and never having it published. This is your chance to get your empire acknowledged – no matter how big or how small. If you’ve put a railroad together and you think it’s interesting – something you’re proud of – why not let us see it here? It doesn’t have to be a complete layout. You may want to show a particular scene or diorama that you’ve done. Or perhaps you’ve built an interesting structure for your railroad that you’re proud of. It could be a kitbashing or scratchbuilding project - or a good weathering technique. All you have to do is write 2 or 3 paragraphs, or more if you want, telling about how you built it, what problems you’ve had to overcome if any, what you like most about your layout or about the hobby, and anything else you think might be interesting about it. If you don’t think you can write that well, that’s okay. Just put something down that makes sense and I’ll fix it. You’ll still get credit for the article. You can show your friends and family the page you made for the Internet about your own model railroad layout. I hope you’ll be able to send us a picture, but you don’t have to. If you have a picture to send, you may have to resize it since the maximum size we can use is 800x600 pixels. You can use your own photo software to do this or download Google’s Picasa for PC or use the iPhoto Export function or even the Preview program for Mac. So if you have a railroad layout or scene that is begging to be shared, here is the place to let us know about it. Model railroaders are always interested to see what others have done just as you are. It really makes us all better modelers. Besides, it's fun to see your own work showcased on a web page! I guarantee you'll like it. But if, for some reason, you don't, I'll fix it or delete it. So, you have nothing to lose. Just fill out the form below, include a picture if you have one, and that's all there is to it. Then, sit back and after a week or so watch YOUR page appear as a link from this page! So if you’ve got something to show, don’t let it just sit there in your basement or garage. Send us a picture. Tell us about it. It’s fun. It’s free. Go for it! Alpine Wonderland - This beautiful European model railroad layout designed and created by Alan Fisher, is an outstanding and inspirational work of art. Ty's Model Railroad BlogSpot - a blog demonstrating how Ty built his layout showing pictures of his track plan and excellent scenery. Dave Coble's Horace and William Creek Railroad - an On30 narrow gauge modular layout. RiverPass III - This showpiece is a fantastic example of what you can do with a layout kit in a 4x8' space. The scenery is very well done. You'll enjoy these inspiring photos. Northlandz - Model railroading on a grand scale. You have to see this to believe it. NYC Botanical Garden 2010 Holiday Train Show - A garden railroad like you've never seen before - timeless and inspirational no matter what season, but you can only visit during the Holidays. You won't want to miss these pictures. Seaboard Railroad Station This restored railroad station in Suffolk, VA is now a museum containing a large 2-room model railroad accurately depicting the area and the time when the station was at its peak. Model Railroad Scenery - A great site with lot of pictures and instructions on how to build all kinds of scenes with interesting terrain, bridges, waterfalls, etc. Bayside and Tidewater Railroad (Canadian Connection) with lots of links to other model railroads in Canada and other areas. 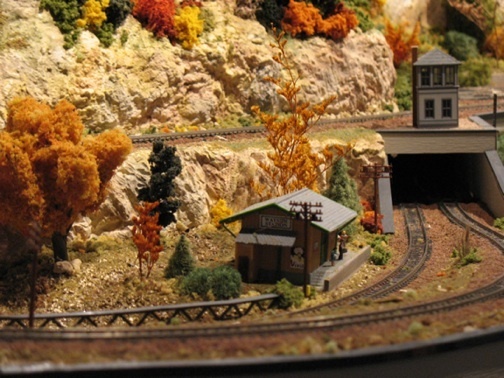 Bob Fahrney’s Model Railroad – an adventure into the world of computer control. From "Model Railroad Showcase" back to "HomePage"